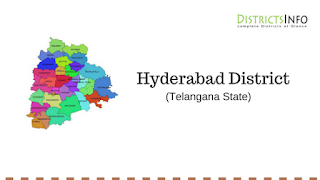 Hyderabad District With mandals: Hyderabad is the heart of Telangana district. Hyderabad was the capital city of United Andhra Pradesh and is also the common capital for now separated Andhra Pradesh and Telangana states. Separate Telangana state was formed on 2nd June 2014. Hyderabad will be the capital city of Telangana after 2024. State capital Hyderabad has a rich history and is popular for historical constructions, buildings, temples, masjids etc. This is the fifth largest city in the country. This is a very well developed city and is the center for software companies. Hyderabad and Secunderabad are the twin cities and these are separated by Husain Sagar lake and are joined by Tank Bund. Hyderabad history tells us that the city was built in 1590 AD by Mohammad Quli Qutb Shah. According to historians, the Telangana region and parts of Karnataka and Maharashtra are ruled by these rules. Hyderabad has a long history of four hundred years. Hyderabad was also called Bhaag Nagar. Hyderabad state became a part of India in the year 1948. In 1956, Hyderabad state was divided into three parts and merged into Andhra Pradesh, Maharashtra and Karnataka states. The area of Hyderabad is nearly 260 square kilometers. Hyderabad has many tourist attractions. Tank Bund joins Hyderabad and Secunderabad. Lumbini Park is another interesting place to visit and the people can enjoy the special laser show and boat riding. One of the popular parks in Hyderabad is Lakshmi Narayana Yadav Park in ESI which is well maintained. Charminar, Laad Bazar, Mecca Masjid, Golconda Fort, Hussain Sagar, Salarjung Museum, Birla Planetarium, Ashtalakshmi Temple, Ocean Park, Mount Opera and other theme parks can be visited in Hyderabad. Hyderabad due to which this place is called Cyberabad or the second Silicon Valley. Hyderabad is famous for the pearl. There is pearls market near historical Charminar. We can also find silver shops, sarees, bangles, clothes and many other shops in Charminar. The population of the new Hyderabad district will be around 39,01,928 with an area of 1914.02 sq.kms. There will be three Assembly constituencies. These are Ibrahimpatnam, Maheswaram and Amberpet. 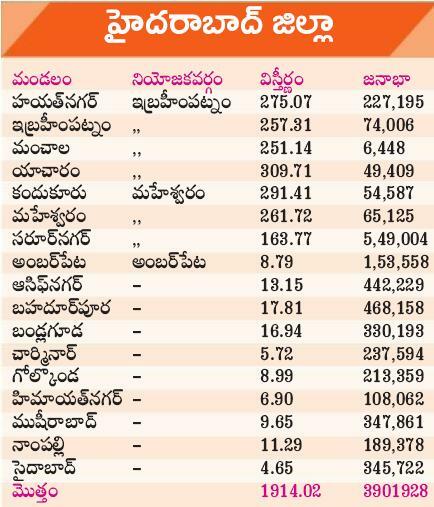 The Mandals to be included in new Hyderabad district are Hayath Nagar, Ibrahimpatnam, Manchala, Yacharam, Kandukur, Maheswaram, Saroornagar, Amberpet, Asifnagar, Bahadorpura, Bandlaguda, Charminar, Golkonda, Himayathnagar, Musheerabad, Nampally, and Saidabad. See the details from the below given table.